Heavy rains spoiled Maj. Gen, William Howe's planned second attack on the American army near White Plains on October 31. The next day the Americans were found to be apparently well entrenched at North Castle Heights. The rebel earthworks were composed largely of cornstalks pulled from nearby fields, whose roots, full of clinging soil, faced outward. Howe may have been discouraged by these illusory defenses, but his goal remained the complete removal of American troops from Manhattan, not the annihilation of Washington's army. His attention returned to Fort Washington which the American commander in chief had left garrisoned under Col. Robert Magaw after a general rebel evacuation of the island. On the night of November 2 a defector, William Demont, entered the camp of Lord Hugh Percy at McGowan's Pass, south of Fort Washington. Demont had been Magaw's adjunct; the deserter placed the plans of the fort into Percy's hands. Although Howe had probably already begun to arrange operations against Fort Washington, exact knowledge of the fortification and its defenses would assist his attack. Fort Washington's works, built the previous July, covered a hill 230 feet high (modern West 184th Street) and a mile long. Vertical cliffs rendered the fort unassailable from the Hudson River below. Additional protection was provided by Fort Tyron on the north, Laurel Hiss on the east, and the old Harlem Heights defenses on the south. Fort Lee stood opposite Fort Washington in New Jersey. Between the two forts ran a line of sunken obstructions to prevent British ships from passing up the Hudson. The natural defenses afforded by Fort Washington's position were superior, but the fort itself was less than ideal. A pentagonal earthwork without ditches or palisades, the structure lacked barracks, bombproofs, and an interior source of water. A captain stationed in the fort noted that it had none of "those exterior, multiplied obstacles and defenses, that...could entitle it to the name of fortress, in any degree capable of withstanding a siege." This weakness, recognized by some of the garrison went unnoticed by Maj. Gen. Nathaniel Greene, who was in charge of both forts. Washington had been out of touch with Greene since October 22. Now, as Howe began moving south to direct the seizure of Fort Washington, the American commander had to consider the fort's defensibility. On November 5 three British vessels passed over the river barricades in the Hudson amidst rebel artillery fire and anchored, undamaged, at the northern tip of the island, Washington, in the process of deploying most of his troops in Westchester County, was much alarmed by this news and wrote to Greene on November 8, "I am inclined to think it will not be prudent to hazard the men and stores," but "as you are on the spot, I leave it to you to give such orders as to evacuating Mount Washington as you judge best." Greene replied that the fort served some purpose beyond the prevention of ship passage up the Hudson. 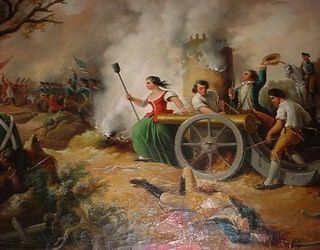 It hampered British communication between the island and the country to the north, compelled the maintenance of British troops at Kingsbridge (which connected Manhattan to Westchester County), and was clearly regarded as important by the British, or else they would not attempt its capture. These arguments were offset by Greene's assurance that if the situation grew dangerous, the stores and men could be shifted to Fort Lee at any time. Magaw said the garrison could hold out through December. But Washington's second in command, Maj. Gen. Charles Lee, expressed ominous concern. In a letter to Joseph Reed, the adjutant general, Lee wrote, "I cannot conceive what circumstances give to Fort Washington so great a degree of value and importance as to counterbalance the probability or almost certainty of losing 1,400 of our best troops." With some 2,000 of his troops, Washington moved down the west side of the Hudson and reached Fort Lee on November 13. Meanwhile, Greene had reinforced Magaw's original garrison of about 2,000 men (Lee's figure was low) with an additional 900. Greene continued to favor a defense of the fort, and Washington finally relied upon his subordinate's judgment. The commander in chief would later write that Congress's desire to retain the area's defense and his own wish to keep an impediment in the enemy's way "caused that warfare in my mind and hesitation which ended in the loss of the garrison." On November 4 Howe dispatched several brigades to march quickly south and reinforce Brig. Wilhelm von Knyphausen. His division had crossed the river at Kingsbridge on November 2 and began harassment of the rebels in the northern outpost of Fort Tyron. During the night of November 14, 30 British flatboats sailed up the river past Fort Washington undetected by the Americans. The following day the enemy approached the fort in force. Lord Cornwallis and Brig. Edward Matthew were to approach from across the Harlem River on the east, and Percy was to strike from the south. A British officer was sent to summon Magaw to surrender with the threat of no quarter if the fort was stormed. Magaw flatly refused. He had dispersed his forces at the various outposts on the three sides of the fort, posting minor detachments in between. The Americans covered a large perimeter of four to five miles. Early on the morning of November 16, Knyphausen opened the attack against Col. Moses Rawlings's Virginia and Maryland riflemen who managed to stall the Germans temporarily. Percy advanced on Lt. Col. Lambert Cadwalader's Pennsylvanians but them halted (to the Americans' surprise) to wait for a signal gun from Cornwallis or Mathew. Washington, Greene, Maj. Gen. Israel Putnam, and Brig. Gen. Hugh Mercer crossed to Fort Washington as the firing commenced, but they could do nothing to help Magaw and so returned to Fort Lee to watch the developing action. Mathew, who had been somewhat delayed by the tide pushed across the river and established a foothold on Laurel Hill. Cornwallis followed with more troops. Once the signal had gone out to Percy, pressure on the Americans began to mount. Rawlings was force back and Cadwalader withdrew. Confusion was rampant within the reduced perimeter; the retreating Americans poured into the fort. By 3:00 PM the Germans had reached Fort Washington from the north, and the British were in view on the east and south. Despite the original surrender terms, another flag was sent into Magaw to ask for capitulation. Realizing that to stand now would create a bloodbath within the crowded fort, Magaw surrendered. The attack cost the British and Germans 67 killed, 335 wounded, and 6 missing. The Americans suffered 54 killed and 2,858 captured, including probably more than 1000 wounded. The loss of all their arms and equipment was especially damaging. Fort Lee was now untenable and Washington began transporting the ammunition out of the fort. On the night of November 19 the British brought boats through the Harlem River and carried a force under Cornwallis across the Hudson in the rain. They landed about six mile north of Fort Lee and began marching southward. Washington and Greene roused the garrison to a hundred flight and led them to Hackensack, then toward Newark and New Brunswick. Cornwallis marched into the empty fort on November 20 and found tents, military baggage, 50 canon, and 1,000 barrels of flour. More than 100 skulkers were rounded up in the neighborhood, a few were killed. Cornwallis pursued the Americans with some reinforcements sent from Howe and routed them at each New Jersey town where they stopped. Many of Howe's officers believed he would maintain this drive. As Lt. Frederick Mackenzie noted in his diary for November 21, "This is now the time to push these rascals, and if we do, and not give them time to recover themselves, we may depend upon it they will never make head again. A body of troops landed at this time at Amboy might, in conjunction with those already in Jersey, push on to Philadelphia, with very little difficulty." But Howe had begun preparations for an offensive in Rhode Island. He knew there was not time enough before winter's arrival to employ the same troop force in both New Jersey and Rhode Island. In addition, Howe was criticized by some for sparing the garrison at Fort Washington. Capt. Lt. Archibald Robertson considered the rebels' losses "trifling." Thomas Jones, a former justice of the New York Supreme Court being held prisoner in Connecticut, believed that a general slaughter would have struck panic through the rebel countryside and forced congressional submission. "The most rigid severity at the first would have been the greatest mercy and lenity in the end." Of the nearly 2,000 Americans captured in the fall of the fort, over 100 were officers. Many of these were paroled and walked the New York streets in their uniforms to the chagrin and even fear of the loyalists and British. The soldiers were eventually put aboard prison ships in the harbor to languish; large numbers of them died under the atrocious conditions. But Howe's victory had been decisive, and for the Americans, the aftereffects were serious. The loss of the garrison troubled Washington because the enlistments of many of his remaining troops were to expire in less than two months. An alarming percentage of his men were unfit for duty from sickness or want of clothes and shoes. Perhaps even more significant was the tremendous loss of precious material. The British had seized 146 canon, 12,000 shot and shell, 2,800 muskets, and 400,000 cartridges. American resources had been dispersed and inadequate before this capture; now they were stretched very thin indeed. Washington would soon make his winter headquarters in New Jersey for a number of reasons, one of which was to protect the invaluable forges and furnaces in the northwestern part of the state. The blame for squandering the men and supplies in the two forts rested naturally with Magaw, Greene, and Washington. Greene recognized that the lines around Fort Washington had been too extensive for 2,900 men to defend, especially in a disordered state. Since Washington had some early doubts about the fort's impregnability, his vacillation, finally favoring Greene's discretion, was inexcusable. Washington's trusted friend Reed termed this a "fatal indecision of mind." Many British were light-headed after their successful New York campaign and felt that the end of the war must be near. But Washington's error was not fatal. Nor was his disappointment so deep that he rejected thoughts of raising a new army.